The mystique of the buckethead brigade has only grown since Boba Fett’s first appearances in the Holiday Special and The Empire Strikes Back. Their backstory- and the historical cultures upon which it draws- have grown only more convoluted over time, as various authors have accented, overwritten, or ignored the works of previous writers. However, certain historical influences can be sussed out from the turmoil. The Mongols, the early medieval Vikings, and the ancient Celts of Gaul (with a dash of modern Celtic flavor) have all played a role in building Star Wars’ most well-known warrior culture. The panel from Marvel Star Wars that spawned one of my favorite retcons in the history of EU continuity. First, a bit of background. Out of universe, the Mandalorians originated with Boba Fett and the background notes established by George Lucas in The Empire Strikes Back– according to Lucas, Fett wore the armor of the Mandalorians, a group of evil warriors exterminated by the Jedi during the Clone Wars. 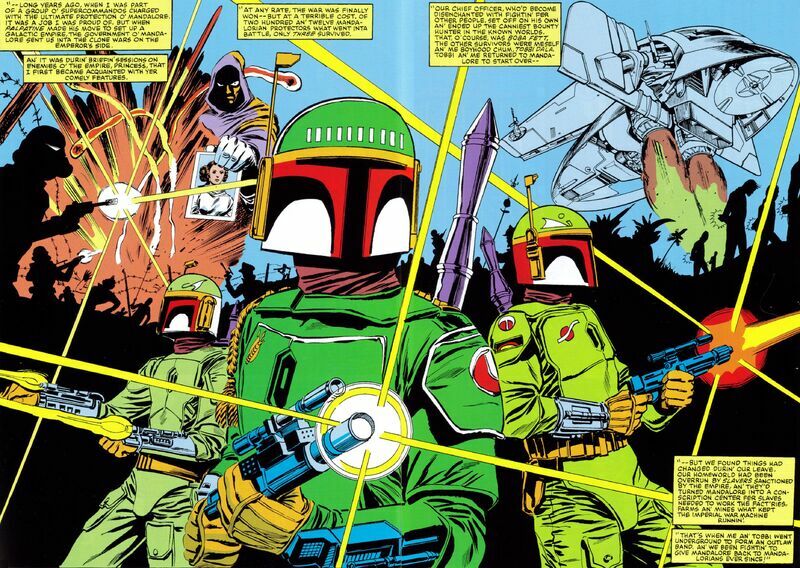 Marvel’s “Star Wars” comic line expanded on the armored menaces, giving them a home planet (Mandalore, later rendered as ”Manda’yaim” in Mando’a) and establishing that their warrior culture still existed post-Clone Wars. The Clone Wars adventures of the Mandalorians were explained (and were later brilliantly retconned by Abel Peña in his “History of the Mandalorians” article, creating Spar a.k.a. Mand’alor Gayiyli, or Mandalore the Resurrector), with the Mandalorians eventually aiding the nascent Republic. While the Marvel era was left somewhat to the wayside in the Bantam-era EU, the Mandalorians continued to be utilized by various authors. In particular, Tom Veitch and Kevin J. Anderson laid much of the groundwork for Mandalorian culture in Tales of the Jedi, depicting the early Taung as nomadic warriors and raiders from the Outer Rim. The Knights of the Old Republic mini-franchise further expounded upon early Mandalorian warrior culture, positioning them as something of a cultural bogeyman to the Roman-inspired Galactic Republic. Later, Karen Traviss added her own substantial interpretations to Mandalorian culture, bringing in further Celtic motifs and developing the framework for a Mandalorian language. 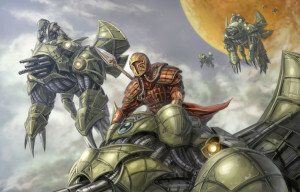 Rohlan Dyre, of KOTOR comics fame, leading a diverse legion of troops into battle. Generally speaking, the Mandalorians resemble various nomadic groups throughout history. They were driven from their original homeworld- Coruscant- and travelled from world to world, settling on planets such as Roon, Shogun, Basilisk, and Ordo before settling down in the Mandalore system circa 7000 BBY. One element in particular links them to the Mongols of the late Medieval period- their willingness and ability to effectively assimilate conquered groups and cultures into their ranks, whether using their technology, taking advantage of their knowledge of trade routes, or simply assimilating them into their ranks. The Mongols under Ghenghis Khan and his successors were able to utilize Chinese knowledge of gunpowder and siege equipment to conduct their military campaigns in Khwarizm, Mesopotamia, India, and the Russian steppes. They were further able to integrate far-flung regions into their (only briefly unified) empire, respecting freedom of religion, expanding trade routes, and providing military protection to the conquered (assuming one survived the initial military assault, naturally). Similarly, the Mandalorians were almost fanatical about incorporating groups who had survived their conquests. Upon settling in the Mandalore system, the ancient Taung (note: the name “Taung” comes from a young Australopithecus skull discovered in Taung, South Africa in 1924) immediately made war upon the native Mandallian Giants, who survived the buckethead onslaught and were subsequently incorporated into the Mandalorian war machine. Later in history, as the Taung themselves were gradually worn down by constant warfare, the Mandalorian culture became incredibly multiethnic, incorporating species as diverse as Rodians, Twi’leks, Herglics, and humans- humans would come to be the dominant species within the Mandalorian culture. He’s climbing on your Capitoline Hill, snatching your Eternal City up. Perhaps one of the most inspired elements of Karen Traviss’s interpretation of Mandalorian history and culture was her utilization of general Celtic elements to color her spec-ops warriors. The Gauls- a Celtic culture that inhabited parts of modern-day France (the Celts themselves settled as far afield as the British Isles, Northern Italy [Gallia Cisalpina], Modern Spain, parts of the Balkans, and even central Turkey [the region known as Galatia draws its name from its former Celtic inhabitants]) were something of a cultural bogeyman to the Roman Republic, similar to the role played by the Persians in Hellenic culture and the Mandalorians in the Galactic Republic. The La Tene culture- a Gallic subculture located in Northern Italy- even sacked the city of Rome itself in 390 BCE, the last time that the city would be breached by a foreign enemy until the Sack of Rome in 410 CE. Not ones to be upstaged by their real-world inspirations, the Mandalorians participated in several battles at Coruscant, such as Ulic Qel-Droma’s raid during the Great Sith War and the sack of Coruscant at the end of the Great Galactic War under the command of Darth Malgus. Interestingly, the Romans were not absolutely averse to friendly interactions with the Gauls, despite their various wars with them- the late Roman Republic and early Empire adopted Gallic-style helmets, and often preferred to hire Gallic mercenaries rather than utilize their own native cavalry. Similarly, the Mandalorians inspired the armor of the Grand Army of the Republic, and the GAR itself was partially trained by (and cloned from) Mandalorian commandos. One last historical inspiration for Mandalorians can be found a bit farther north in Europe – the Vikings of Scandinavia. Much like the Mandalorians, the Vikings were perceived as a highly militaristic culture, the scourge of Western Europe. 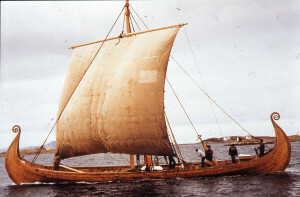 While recent archaeological evidence suggests that the Vikings also engaged in a great deal of long-distance trade, transmitting goods and ideas along the seas of Western Europe and the Volga and Dniepr Rivers, their reputation as successful raiders is nonetheless well-deserved. They were able to conduct long-distance raids through the use of their longships- vessels that could travel rivers, coastlines, and the open sea. The ancient Mandalorians were able to utilize their Basilisk War Droid to similar tactical effect, popping out of hyperspace astride fighter-sized technological terrors that could operate in deep space and in an atmosphere. While they at times menaced the Eastern Roman Empire, Viking mercenaries were eventually hired to form the Varangian Guard, an elite unit in the Eastern Roman military. By the 12th century, the makeup of the Varangian Guard had largely shifted from soldiers of Norse descent to men from the British Isles. While they were an almost existential menace in the Republic’s psyche, the Mandalorians were perfectly willing to work for Coruscant when it suited them. They were hired by both sides during the New Sith Wars, and as mentioned earlier trained the Republic’s army prior to the Clone Wars (which did not preclude the Mandalorians from fighting against those very clones- Mandalore the Resurrector’s 212 Supercommandos were almost entirely wiped out in an engagement with the Galactic Marines on Norval II). The aforementioned gradual shift in Mandalorian identity from a single species to a multi-species culture is also reminiscent in the make-up of the Varangian Guard. While almost certainly unintentional, the way in which these historical cultures have been interpreted, reinterpreted, and rewritten mirrors the rather haphazard nature of Mandalorian continuity. The Vikings, who for years were seen as little more than raiders, have in recent decades been re-evaluated for their impact on trade throughout Europe and the Middle East. The Mongols have experienced a similar renaissance in Western historiography, in recognition of how their conquests aided in the exchange of scientific, social, economic, and military ideas between Europe and eastern Asia, as well as their ability to integrate a far-flung heterogeneous empire. The ancient Celts, of course, have been utilized as nationalistic symbols by their descendants in the British Isles and France- although the modern nation of France is more directly connected to the Franks than the Gauls. In a similar vein, the Mandalorians have gone from simple elite villains to a dynamic warrior culture who occasionally even get to play the hero. Great read, nice to get more background history etc on the mandos. Love the Republic Commando series for looking deeper into Mando culture. Thanks for the historical prospective/tie-ins to their story.